Mackley has completed a project to fill a 28-metre gap in the flood defences in the West Sussex town of Littlehampton – in turn reducing the flood risk for 2,000 homes. Working as part of Team Van Oord and on behalf of the Environment Agency, the £680k, 20-week project included organising the planning application and producing the detailed design, followed by installation of a sheet piled wall and concrete capping beam alongside the River Adur. Investigations showed the existing river wall to be in a very poor condition, while the works would have to be carried out in a tricky location with restricted access. To overcome these constraints, the new stretch of river defence was placed in front of the existing defences, further into the river. This had the benefit of shoring up the existing defences and meant that piling was through new river bed ground. It also limited disturbance to the local community, thereby helping to gain planning approval. The installation of the sheet piles took place from a jack-up barge, supporting a 70t crawler crane. The barge arrived in a good weather window, having been transported from Tilbury. The barge was then towed into the harbour and loaded with equipment – before being towed along the river, floated through a pedestrian bridge and moved into position at the work site. 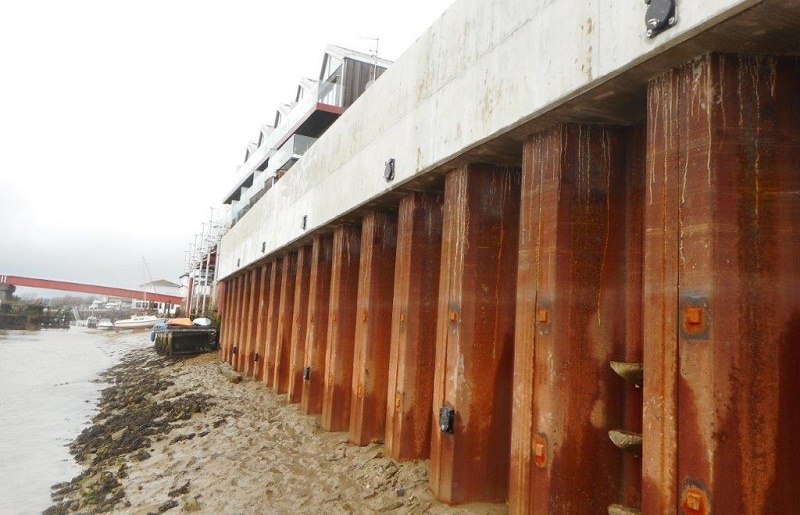 The 18m piles were selected to complement the existing adjacent piles and to provide a 50-year life span. Pile stability was enhanced by increasing the section size, rather than length – which would have meant driving into a band of hard material, with the risk of vibration damage to an adjacent 130 year old cob stone building. The piles were driven with a vibration piling hammer to reduce noise and vibration. To maintain an accurate pile line, Mackley designed and installed a piling gate. “Our combination of construction and design expertise enabled us to produce a design which overcame complex ground conditions – including buried timber and a perched water table – while maintaining flood defence levels at all times. “Throughout the project, we worked with the harbour master and local businesses to ensure the river road remained open at all times to minimise disruption for local residents. The project was completed with a backfill between the new and old defences of self-compacting granular fill. This filled the main voids and stabilised the ground immediately behind the new wall. The last gap in the wall was closed by installing new flood glass.